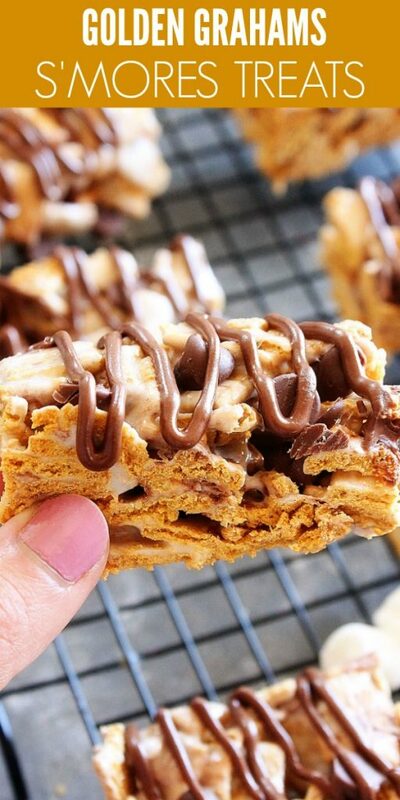 Golden Grahams S’mores Bars are filled with the classic cereal, marshmallows, and of course milk chocolate. 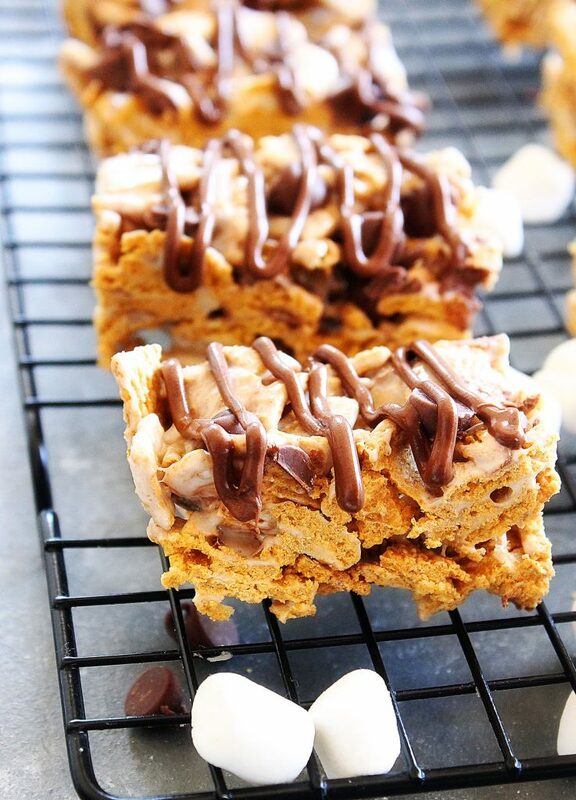 They are a fun and yummy twist on s’mores treats! Hi everyone. 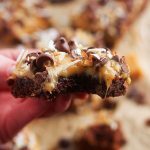 It’s Kathryn again from Kathryn’s Kitchen Blog bringing you some delicious Golden Grahams S’mores Bars! 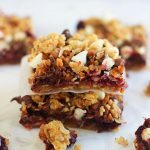 They are the perfect no-bake summer treat you will have to try! 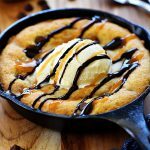 They only require 5 ingredients to make and do not require an oven at all. You can make these tasty treats for a fun get together or for an afternoon school snack. They will not disappoint anyone! 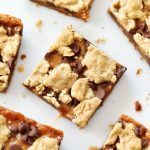 It is hard to not love Golden Grahams S’mores Bars, after all, they will remind you of camping and sweet summer time. Your taste buds will be thanking you too! 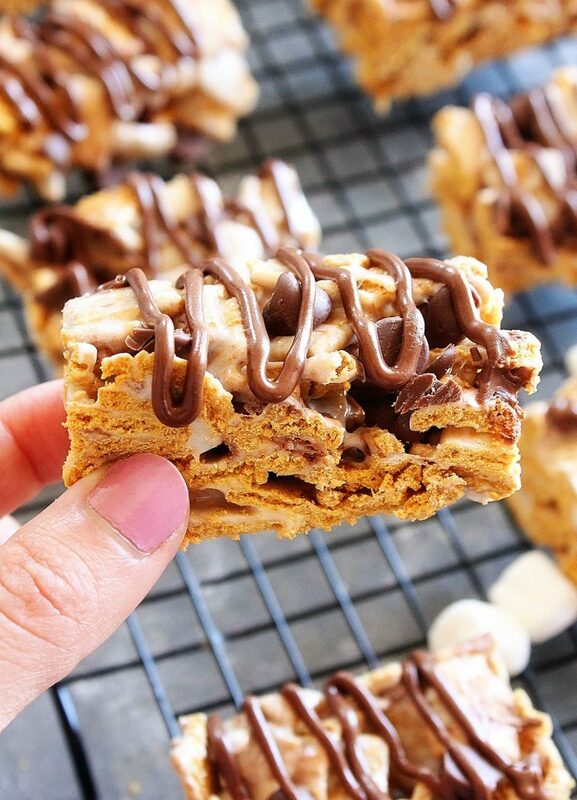 The Golden Grahams cereal is covered in gooey marshmallows and then topped with melted milk chocolate, YUM! 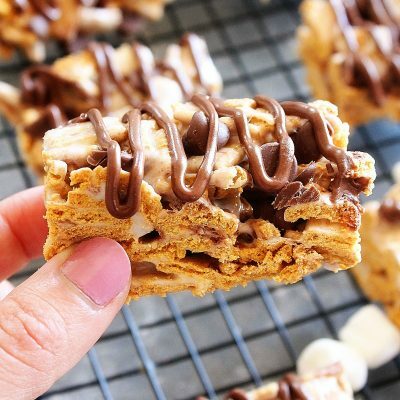 These have all of the traditional flavors of the real deal graham crackers, marshmallows and chocolate, but with just a fun twist with the cereal instead! Just be sure to have a cold glass of milk nearby! In a large saucepan melt butter over medium heat until completely melted. Add the marshmallows and stir constantly until melted. Once melted, remove from heat and quickly add the Golden Grahams cereal. Stir until the cereal is fully coated in marshmallow. Spray a 13 x 9 inch baking dish with non-stick cooking spray. Pour the cereal mixture into the baking dish and lightly press the mixture down evenly. Sprinkle ⅓ cup of the chocolate chips on top of the treats. Melt the remaining chocolate chips for 30 seconds in the microwave. Drizzle evenly all over the top. Cool for 20 minutes. Once cooled cut into bars to enjoy!